Give your guests a day they’ll never forget (and something to do while you have your photos done) with fun and creative outdoor wedding games perfect for a summer soiree! From jJengato karaoke, the list of fun activities is endless. Let your guests put their knowledge to the test in an exciting game of bride and groom trivia with fun questions relating to your relationship. If you’re hosting your big day at a big outdoor venue, be sure to include this fun and competitive game for your guests to take part in. Use giant chess pieces, or simply paint big water containers black and white to fit the chess board theme. Adding a few poker tables to your reception area is a great way to keep guests entertained, and can go along with a fun casino wedding theme. Set up a chalkboard word game with words relating to your big day and let guests use their skills to find them all. Go big with your photobooth and include boxes with dress-up goodies. You can even be funky and include a few Snapchat filter look-a-likes to get some great pics and loads of laughs. Stack up on all of your favourite boardgames and lay them outside on a table with some picnic blankets for fun activies that will remind your guests of fond childhood memories. This one’s always a winner! One way to get the party started at your reception is to set up a karaoke station and get everyone to take part in singing their favourite hits. Similar to pin the tail on the donkey, set up a picture of the man of the hour and get guests to attempt to pin on a tie while blindfolded. It’ll be loads of fun! If you have children at your wedding, setting up a play area with big lego pieces will keep them busy and entertained during your reception. It may even attract some adult guests too! You can’t go wrong with Jenga! This simple game is an easy way to let your guests have a great time. 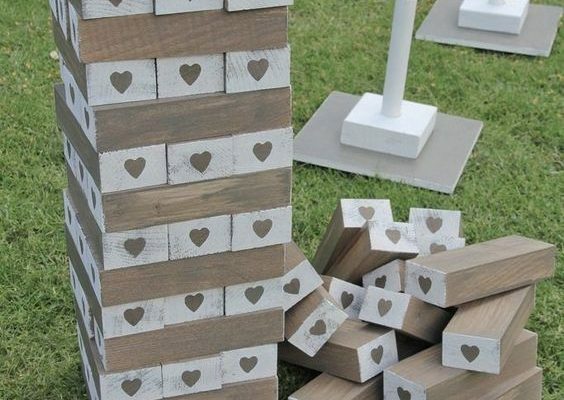 Set up a few Jenga games on some tables and let your guests do the rest.